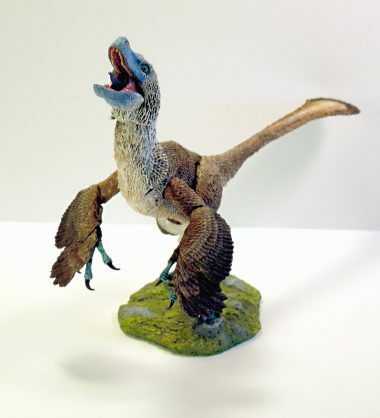 Microraptor gui (little thief ) was a small, four-winged bird-like dinosaur from Early Cretaceous Liaoning, China. 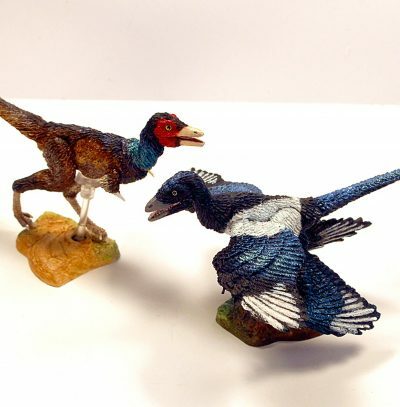 It is known from numerous well-preserved fossil specimens, providing important evidence about the evolutionary relationship between birds and dinosaurs. Having long pennaceous feathers on the arms, tail and legs, paleontologists speculated that it glided using all four limbs for lift. Later studies suggest that Microraptor was also capable of powered flight. Mononykus olecranus (one claw ) was a theropod dinosaur from Late Cretaceous Mongolia. This nocturnal hunter had long, skinny legs and probably ran at high speeds in the open flood plain habitat. It’s small skull and pointy snout housed small sharp teeth, likely for eating insects and small lizards and mammals. 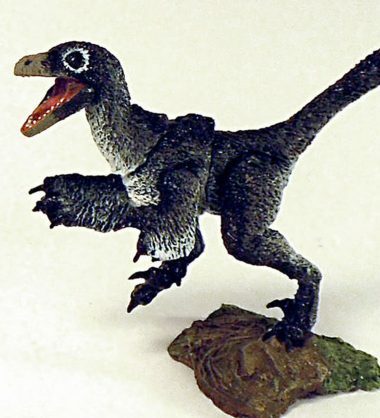 Each set features 2 raptor figures, each approximately 6″ long with 7 points of articulation and includes two bases, multiple posing rods and attachments, collectible trading card, and unique background display insert. Packaging features red-foil printing and art by Shannon Beaumont.